A MAN CAN DIG and LOAD 5 or 6 cubic yards a day in average soft material. A machine equipped with a 1 cubic yard bucket is capable of averaging 70 cubic yards an hour. Larger machines deal with proportionately larger quantities. This illustration shows an electric shovel with a 9 cubic yard bucket. THE building of a railway generally involves a serious onslaught on the obstacles of Nature, and mechanical invention has supplied modern railway builders with an imposing array of machines with which to attack the earth. Excavating machinery plays the major role, and is aptly called the engineers’ heavy artillery. The construction of one hundred miles of road may entail the removal of thousands of tons of earth and rock, but the same length of railway may, in certain conditions, involve the removal of several million tons. Except in the flattest country, it is seldom that a track does not pass through a full cutting, a side cutting or a tunnel, or run on the top of an embankment. The railway builder must make his “cuts” and “fills” balance. He must so lay his line of route and levels that the excavations from cuttings and tunnels may be used for the making of embankments. The excavation works on the early railways were made by men alone, and without any of the mechanical marvels now available. Earth and clay were attacked by gangs of navvies armed only with picks and shovels. The material was loaded into horse-drawn carts and wagons. Even when cuttings or tunnels were driven through rock, the materials, after having been dislodged by explosives, were loaded by hand labour into wagons and afterwards dumped when an embankment was needed. The ordinary navvies’ shovel can hold but a small quantity of material, and a worker cannot do more than handle up to 50 lb by hand. The pioneer method was therefore slow and laborious. Room to swing a pick and wield a shovel was about all that each navvy was allowed for working space, and to save time large numbers of men were engaged on each single operation. A new railway job of any magnitude is comparatively rare to-day, but when it does occur it presents a scene of mechanical bustle; for machinery is everywhere, and the human element is less apparent than it was. Mechanical diggers, draglines, scoops, graders, rooters and loaders, with trains of dump wagons drawn by steam, oil or electric locomotives, now take the place of the great armies of navvies of former days. Modern excavating engines have prodigious appetites for earth and rock, and they all spring from the original idea of trying to copy by mechanical means the exact movements of a human navvy. We can go back three hundred years or more for evidence of the earliest known excavating machines, which were used for getting material from under water. These machines were not used for land excavation; they took the form of a grab, or an endless bucket machine or dredger. It is likely that they were the first inspiration of the land excavator of to-day. Men could not dig under water, and were therefore forced by necessity to invent. Such machines were probably crude, hand-operated instruments, but they were undoubtedly the beginning of more efficient inventions that came later. Early last century, William Otis of Boston, USA, conceived the idea of making a machine to imitate the movements of a human navvy in action, and this was the first steam navvy or digger produced. This machine was built for Otis of Boston by John Southern, also of Boston. It was a very crude affair, judged by present-day standards, but it did the work of excavation on the first American railway in a manner far exceeding the expectations of the inventor himself. We can judge how closely William Otis was able to imitate the actions of a human navvy with his machine by studying briefly the construction and operation of this early digger. The carriage was constructed of stout pieces of timber firmly bolted together and fitted to two pairs of small, flanged wheels, so that the machine could be hauled on rails up to the working face of the excavation. At one end of the carriage a vertical steam boiler was placed, and near the other end a heavy iron post was fitted. This post was held upright by a frame and iron tie bars, but was free to revolve horizontally in bearings. Between the boiler and the post a steam engine and winch were placed. This single engine did the work through various gears and levers. The digging gear consisted of a heavy jib made of timber fixed to an iron post and free to revolve with it. The effective end of the machine, and the counterpart of the human navvies’ hand shovel, was a wooden bucket strongly bound with straps. The bucket was fitted with iron teeth at its cutting edge, and was carried on an adjustable radial arm working on the lower member of the jib. To enable the bucket to dig, power was communicated to it from the steam engine on the carriage by means of a chain. With this description before us we can now examine the machine at work. Imagine it has been hauled up to the working face. A chain has been run out so that the teeth of the bucket are at the point in the face at which we would strike with a hand shovel. Steam is now turned on, and the chain hauled in; the bucket travels in an upward circular path outwards into the face, and upwards until it is full. So far, the bucket has carried out fairly closely the movements of a man with a hand shovel picking up a load. At this point the human navvy would swing his shovel until it was over the dump wagon, and then turn it over to discharge the load into the wagon. See now how William Otis accomplished this on his machine. A large horizontal wheel, called the bull wheel, was fixed to the top of the post. From another part of the engine a second chain led up to the frame, and round the bull wheel. By working levers this chain was put into operation. The bull wheel and with it the jib and the bucket were swung round until the load was over the dump wagon. Now, to turn the bucket over to discharge its load after the manner of a shovel would be both complicated and impracticable. Instead of attempting this unwieldy motion, Otis made the bottom of the bucket in the form of a lid with a catch to hold it closed. With the bucket over the wagon a pull on a line released the catch, and caused the lid to fall open, and the load would drop into the wagon. While the first of the two chains mentioned above was run out to lower the bucket for the next stroke at the face, the bucket lid would swing to and the catch would hold it closed until the next pull on the line. William Otis made a very good attempt at working his steam navvy in the manner of a human navvy. The fundamental principles of his invention were right. He even provided the means of varying the cutting radius, and the distance of discharging the load of his machine, by racking the bucket arm in or out on the jib, as required. The largest mechanical diggers of the present day include all the movements of the Otis machine in their operations. In the modern machines, of course, these movements are greatly elaborated and improved. Instead of the single engine and the complicated system of levers of the early machine, the modern diggers have separate engines to control each movement; and in the hands of a capable operator the present-day mechanical digger is almost uncannily human in adapting its every movement to suit the various classes of material with which it has to deal. The machine produced by Otis could only dig, at the most, about one-quarter of a ton at each stroke. To-day there are diggers that extract as much as twenty-four tons at each bite. One man, working a few levers, thus does the amount of work previously done by hundreds of workmen. Between 1839 and 1874 a number of the earlier steam diggers was built, and used on the construction of American railways with varying success. Some of the machines found their way to Europe, but were not considered a success. They were probably judged as new-fangled and a menace to the labourers’ livelihood - a reception given to most early inventions. While America was developing machinery, the old world still had armies of navvies to pack into new tunnels and cuttings. There were no such armies in America. The men were not there in such numbers. The more rapid development of machinery was, therefore, inevitable. Britain took the steam navvy seriously in hand in 1875. In that year a remarkable machine was produced. Ruston, Proctor & Co, of Lincoln, introduced the Dunbar and Ruston Steam Navvy. In a discussion on this machine Mr. Joseph Ruston, of Lincoln, said: “A substitute for pick and shovel has long been sought. The problem may be considered to be solved by the steam navvy, which is believed to be perhaps the most successful machine yet introduced to this end, being not only merely suitable for one form of digging, or for one kind of material, but also capable generally of dealing with every large excavation which contractors are called upon to make, and proving itself expeditious, reliable, and most advantageous help”. With the Otis machine in mind we can see that Mr. Ruston was giving expression to what had been the intent of William Otis. The Ruston machine of 1875 became famous, and steam navvies were soon at work on the construction of railways. The basic ideas of Otis were incorporated in this machine. The fundamentals are all there. Mild steel plates and steel beams were used in place of the old timber portions of the Otis. The Ruston machines were in great demand. They were used on the Great Northern and the London and North Western Railways at Melton Mowbray, the Midland Railway at Manton and Bootle, the Dover and Deal Railway at Dover, the Rugby and Northampton, the Didcot and Southampton Railways, and others. Descriptions of various developments of machines may well be prefaced by a simple explanation of the functions of various types. In a modern power shovel there is a rigid jib, or boom, a rigid digger-arm working through, or round the boom, and having at its effective end a suitable bucket with digging teeth to bite into the material to be excavated. The operations are carried out, starting with the bucket-arm in a more or less vertical or upright position, the bucket resting on the ground at the bottom of the cut, the teeth being horizontal, and the open side of the bucket facing the material to be attacked. By means of the hoisting or winding gear the bucket is then dragged forward and upward into the working face, at a speed of about two feet per second in light material. At the same time that the driver starts hoisting, he thrusts the bucket into the material by means of the racking engine on the boom, just as a navvy thrusts his shovel into the material that he is digging. With the hoisting engine control in one hand, and the thrusting or racking engine lever in the other, he regulates the depth of cut that can be made as the bucket is hoisted towards the boom head. In such a way, when the material is of a uniform nature, an even cut is taken from the bottom to the top, so that the bucket is completely filled as the top of the face is reached. The driver now at once throws out the hoisting clutch, puts his foot on the brake to support the bucket on the now free drum, and racks the bucket in towards the boom to clear the working face. The slewing engine is now set into motion, and the bucket is swung sharply round over the wagon, or dumping point. The bucket door catch is withdrawn, and the material dumped. The slewing motion is then quickly reversed again, and the bucket swung back into the face, opposite the next cut to be taken. By means of the foot brake the bucket is lowered, and controlled on the face-drum, so that it rests on the ground ready for the next cycle of operation. All these movements can be made in twenty seconds by a light modern machine. The power shovel action is essentially outward, upward, and positive, due to rigid digging members mechanically controlled, and it will be at once obvious that these actions are exactly those of a man digging with a shovel. Whereas a man will dig and load 5 to 6 cubic yards per day in average soft material, a machine equipped with a 1 cubic yard bucket is capable of averaging 70 cubic yards per hour. Larger machines deal with proportionately greater quantities. The early diggers were what is known as the railroad type, that is to say, they were mounted on a strong railroad bogie car. On this car is mounted a boiler, and the necessary steam hauling mechanism, and, of course, the usual boom and dipper handle with digging bucket attached. All this had a bull wheel, or rotating base, which was capable of being swung by a chain, or, alternatively, by a wire rope drive to either side of the machine, to load up wagons brought up by tracks laid one either side of the digger. It was only possible with the original type to make one, or one and a half, digging and tipping operations a minute in the most favourable working conditions. Compared with this the modern type will carry out the digging and tipping operations four times a minute when a skilful driver is operating the machine. The skill of the driver of the machine plays a very considerable part in speed of working, and it is desirable that he should also be experienced in keeping his machine in good working condition. The limited swing was a considerable disadvantage, as the wagons could be loaded only alongside the machine; it was possible to excavate only in front of the machine owing to the tracks being up alongside, thus blocking any possibility of digging work on either side. When making a side cutting where the machine was working along a long face, it had to travel along its rails back to the beginning of the face again in order to cut in the same direction for a wider area; or it had to be turned bodily round to enable it to cut its way back. This was, of course, a laborious operation. Some means of overcoming these disadvantages had to be found, and an excavator to meet such problems was produced. This excavator was called the “crane navvy” or “full circle shovel”, a wonderful advance on the older types. It marked a new era in mechanical digging. The “crane navvy” was mounted on rails, or road wheels, and at first was a single-engined machine. Similar to the present-day locomotive crane it could swing through a complete circle, and could therefore dig all round, and also discharge in any position. The machine, thus able to do a complete circle, could load the wagons behind itself, so that the track did not require to be brought farther than the back of the digger. A DIESEL HALF-CUBIC YARD shovel loading a wagon during the widening of a portion of the LNER at Ipswich. The old “crane navvy” compares very favourably, from a speed point of view, with more modern machines of the railroad type. The railroad type of machine held the field until about 1910, but in the early part of this century there was much controversy about it. Many and varied opinions were expressed on the best practices to be adopted in “muck shifting”, as it is called. This brought about the multiplicity of designs in use to-day. It was found that the old single-engined machines were becoming internally complicated, as one improvement after another was added. Hence the multiple-engined machine came into being. 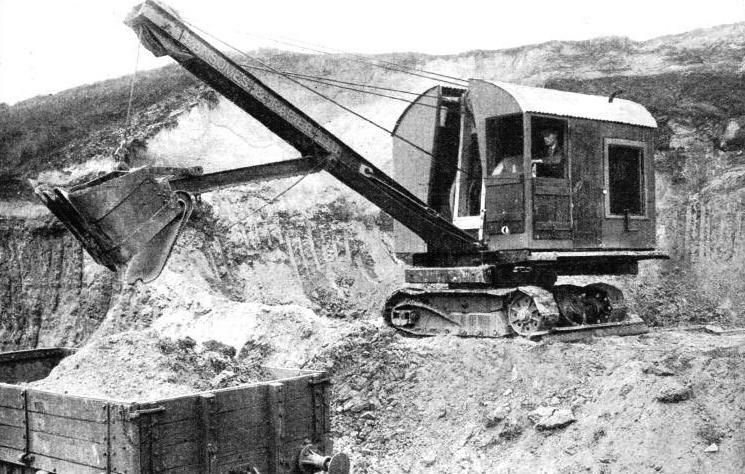 The three-engined steam excavator was produced, having a separate engine for hoisting, swinging, and crowding. In this way the complications of the old single-engine machine were overcome. A great deal of the complicated transmission gear was done away with; moving parts were reduced to a minimum. Much higher speed of working was obtained, and a better machine from every point of view was the result. Since 1910 there has been very rapid development. “Caterpillar wheels” have displaced railway wheels and rails. The arrival of the internal combustion engine marked another step forward for the excavator, as did the perfecting of the electric motor; and now we have also the Diesel crude oil engine. The advancing steps of the mechanical excavator were as follows: (1) The internal combustion engine excavator; (2) the single-motor electric excavator; (3) the two-motor electric excavator; (4) the large revolving excavator; (5) the three-motor electric excavator; (6) the Diesel crude oil engine excavator. A brief description of some of the modern machines may be interesting to many readers who have followed the history of the excavator from its early beginning. This was a machine which the advance in electric equipment and the invention of the internal combustion engine made possible. It takes the place of the old single-steam-engine machine. The next stage which comes into being is the two-motor electric machine, a stage between the single-motor electric machine and later developments. Some advantage was gained over the single motor. Here we have a modern, up-to-date machine which eliminates the complications of the gearing of the one-and two-motor machines; as the three-engine steam excavator was a great step forward compared with the single-engine steam excavator, so the three-motor machine is an advance on the single-motor electric machine. The Diesel crude oil engine now makes its appearance as a power unit, and has been used on all sorts of machines. The power excavator was soon adapted to its use, and the Diesel electric excavator, universally in use to-day, came into being. It is cheaper to run than the all-electric machine, especially where electric current is not obtainable at cheap rates. In many instances excavation has to be removed from under water in places not suitable for the working of a mechanical shovel. Here another device, known as the grabbing excavator, comes into use. Its action is similar to that of a human hand reaching down and grabbing. There are various types of grab buckets. One is known as the orange-peel bucket, since it looks like an orange with the peel cut into three strips, or leaves, and sometimes four. Several types of grab bucket have been produced. The clamshell is another much in use and takes the form which its name indicates; it is in two halves, sometimes fitted with teeth and sometimes not. Two power operated wire ropes are required, and two hauling drums, for working this machine. One rope lowers the bucket and opens it, while the other hoists the bucket and closes it. The opened bucket is dropped into the material, and then closed by the closing and hoisting rope, biting into the ground to fill itself. Another well-known type is the dragline. This is a rope-controlled scoop arrangement, and has two power driven drums, one for the hoist and another for dragging the bucket along the ground. The mouth of the rope-controlled scoop or bucket faces the machine when the bucket starts scooping. The bucket is pulled towards the machine itself, and is gradually filled up as it is dragged along. When the bucket is full the hoist arrangement then comes into play, lifting the bucket clear of the ground. It is then swung to the dumping place, and the drag rope is released, causing the bucket to up-end and discharge. The difference between the power-shovel excavator and the dragline excavator is that whereas the shovel is a rigid member cutting the ground away from itself, the dragline has a flexible rope-controlled bucket, and cuts the ground towards itself. The dragline has a very long boom and reach and can take in a much greater area than can the shovel. Its long reach often renders other means of transport unnecessary. It is set over its work, and works downward, where the shovel is set on a level with its work, and works upwards. The shovel boom must be heavily built to withstand the great strain thrown upon it by the enforcement of the dipper bucket into the bank, and the necessity for pulling it through. The boom of the dragline is long and light, having to take only the weight of the loaded bucket and the strain of swinging the load. 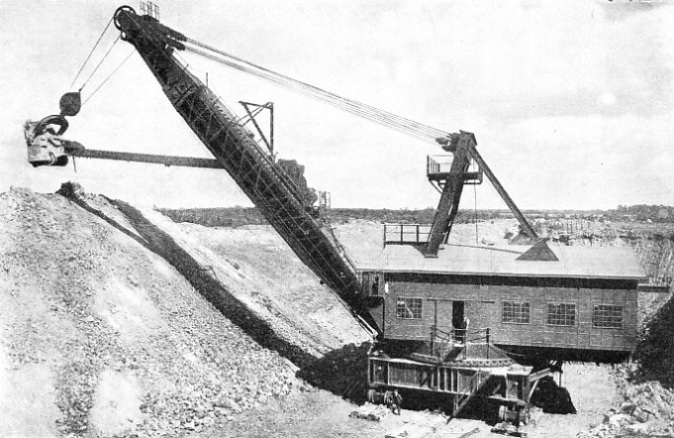 The dragline has been in use only a comparatively short time, but it is so effective in certain classes of work that it has supplanted the shovel to some extent. The dragline machine is seldom used in digging blasted rock or in the hardest forms of clay, but it can tackle fairly tough clay and, of course, is highly efficient in easier digging. Where materials have to be transported a long distance from the digging point to the dumping point, the tower excavator comes into play. The large machines of this type have two towers, one the head tower, with most of the machinery, and the other the tail tower with engine and boiler for changing the length of track cable, and for moving on its two narrow gauge tracks. The bucket is a drag bucket, which is pulled from the head tower by the dragline into the cut. A cable runs from one tower to the other, from which the bucket is suspended. Pulleys run along the cable to allow the drag bucket to travel freely along between the two towers. The particular object of the track cable, as it is called, is to raise the rear end of the bucket while digging, and also while dumping; and to furnish a track to support the emptied bucket in the air when travelling back to the digging point. If the grade of the track cable is sufficient, the empty bucket will run back to the digging point by force of gravity. The back hauling rope is used to obtain greater speed in running back. The bucket is pulled along the ground when filled, by the dragline. Only when the bucket is empty is it in the air, that is, on its run to the digging point from its dumping place. The material may be so moved up to a distance of 500 ft. The large machines use a 6 cubic yard bucket to enable a considerable quantity of material to be moved at each operation. Another type of shovel is known as the drag-shovel. This shovel is attached to the end of the boom. It is thrust into the material to be excavated, and dragged until it is filled, when it is lifted up. The power excavator, or “shovels”, are rapidly convertible for digging, grabbing or dragging. Different jibs are required for each purpose, and extra hauling drums are also used. Anchorages are, however, provided on most modern machines, which make it possible to convert and prepare them for their different functions in a few hours. In addition to working singly, machines can be used to work together to relay materials from one to another. Thus we see how the heavy artillery of the engineer has developed from its earliest inception to our own times, and how necessity has become the mother of invention in this, as in all other forms of mechanical progress. The development of the engineer’s heavy artillery, or mechanical excavators, from their inception to the present day covers a period of nearly one hundred years, and quite definitely with this machine it was an example of necessity being the mother of invention. But for the sudden and rapid development of railways in the middle of last century, we should most likely have had to wait many years for the appearance of a mechanical excavator. Development of more recent years, as we have seen, has gone forward by leaps and bounds; but this is not due to railways so much as to the discovery and mining of coal and minerals generally in various parts of the world. It is hard to say whether we have now reached the limit of improvements and developments; that remains for the future to show. A mechanical digger has, for instance, recently been produced which will dig out rock. We must, however, go back to the railway, and give it credit for bringing the old steam navvy into being. You can read more on “Engineering Equipment” on this website. You can read more on “The Electric Excavator” and “The Portable Mechanical Hammer” in Wonders of World Engineering.